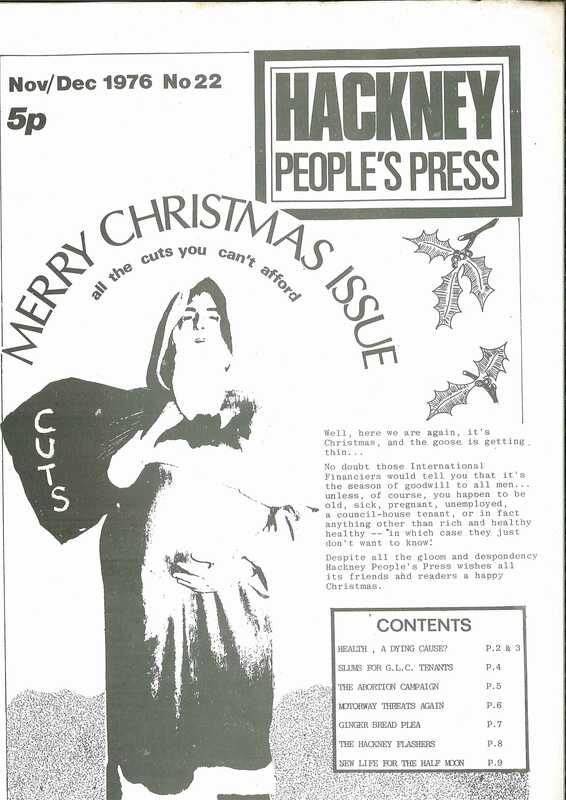 Another instalment in a very occasional series which looks at a year in the life of radical community newspaper Hackney People’s Press. 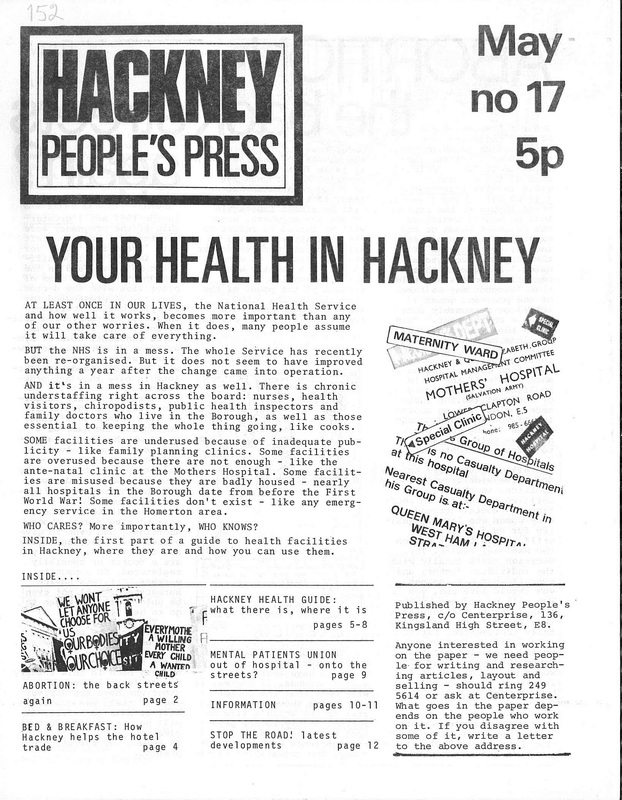 We last saw HPP in 1975, with a focus on health, Hackney Mental Patients Union and lots more. A demand by the Hackney Nursery Campaign for More Nurseries – “There are 4000 children under five years old in Hackney whose parents both work (or in the case of single parent families, whose one parent is at work). To cater for this immense need, there are 379 Council day nursery places at the moment…” the campaign emerged from discussions between Hackney Under Fives, Council nursery workers and the women’s subcommittee of the Trades Council. Speed up long term plans for purpose built nurseries. 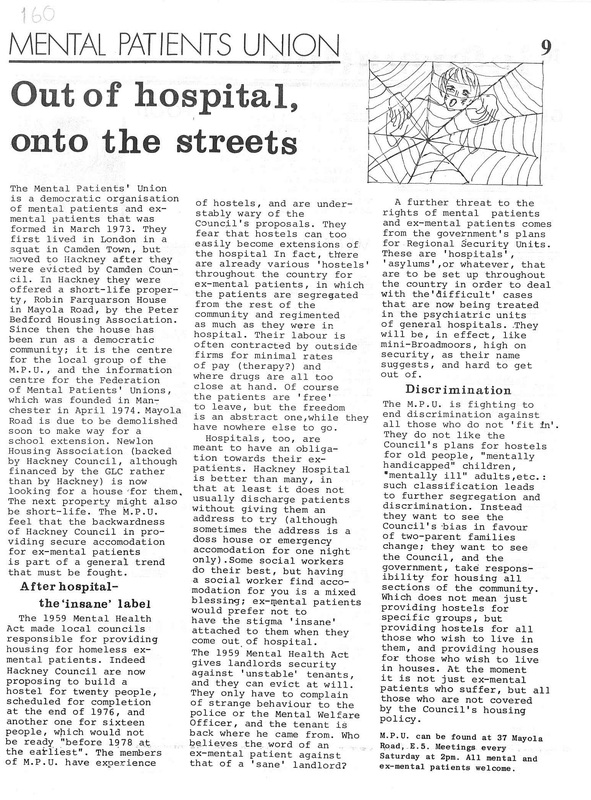 This was to be an ongoing issue and was part of the reason for the emergence of radical nurseries such as Dalston Children’s Centre in the early eighties. 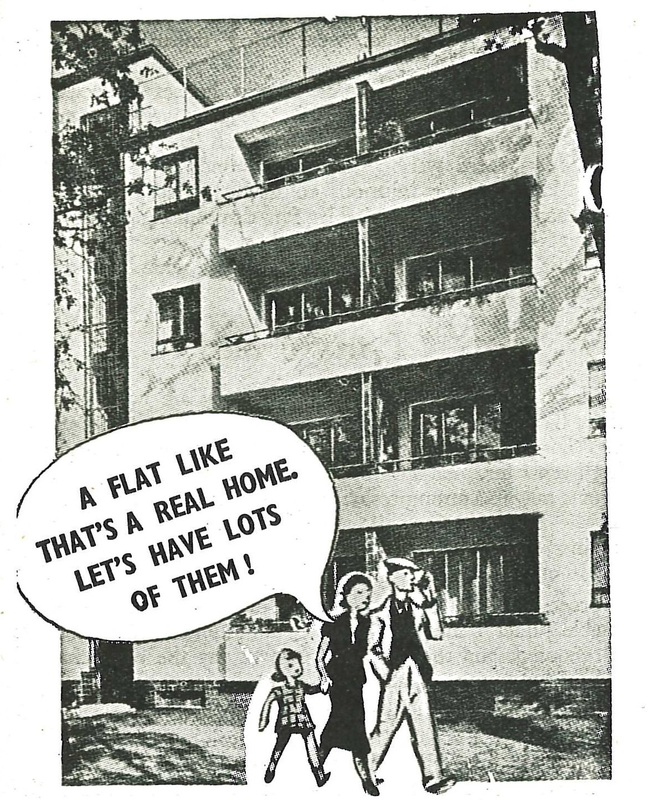 Unfortunately landlords are very much still with us 41 years later, so this sort of campaigning is still sorely needed. Luckily we have Hackney Renters to take up the gauntlet. Homerton Project: new life in and old library – A centrespread on plans for a community centre being developed in the old library building on Brooksby’s Walk. The old library had been closed in 1974 when the new library opened (it’s still there on Homerton High Street). The Citizens Advice Bureau had been using the old library building but the article mentions an impressive array of plans for educational, social and cultural activities. Many of these did actually take place as the old library reopened as Chats Palace later in 1976. Things hot up in July with an expanded 12 pages. In the general election of 1974, NF candidates received 1044 votes in Hackney North and 2544 in Hackney South and Shoreditch (the latter being almost 10% of the vote). After this they announced that fascist grandee John Tyndall would stand for MP in Hackney at the next election (which he did in 1979, with reduced vote share of 7.6%). Four hundred local trade unionists and anti-racists marched through Hoxton (taking in the market and Derrick Day’s house). There was a small NF counter protest which stuck to shouting racist slogans. You can read the full article by clicking on the image above. There was a lot more work to do. 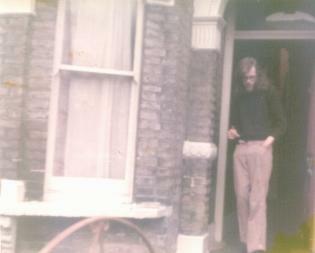 In 1978, the National Front opened its headquarters, Excalibur House at 73 Great Eastern Street in Shoredtich. Pollution: The Socialist Answer – a report on the inaugural meeting of the Socialist Environment and Resources Association. Bad Deal for Backward Kids – a slightly excruciatingly worded article by today’s standards, but obviously well meaning. Cuts to resources and bad planning at the new “Educationally Subnormal School” at Nile Street in Hoxton. Broadway Market Is Not A Sinking Ship – It’s A Submarine – attempts by squatters and other locals to reclaim some waste ground opposite Brougham Road and Brook Road which was due for redevelopment by the GLC. The hope was that the space could be turned into an adventure playground. Highway Robbery on the Buses – fares go up, even though there are less buses. A mixed bag of proposals including mention of the Italian “autoreduction” campaign in which unions issued passes to passengers at the old prices, which were endorsed by drivers. Less excitingly there is also talk of trade councils passing resolutions and sending letters of complaint to the London Transport Executive. And: Health cutbacks and closures, Claimants Union, appeal to rebuild a hospital in Ky Anh Vietnam to treat victims of the war, listings, Hackney Marsh Fun Festival. Themes from previous issues continue- cuts to health services, unemployment up, nursery provision down, benefits claimants get a poor deal. Workers Sacked for Striking – The Psychiatric Rehabilitation Centre was a Hackney based organisation that helped “ex-mental patients find their feet in society”. Its staff had a number of grievances with the trustees, including no written contracts or pay scales, no grievance procedure, poor communication, etc. They unionised and were about to strike when they were dismissed. There is an account of a discussion with PRA Director John Wilder and some rebuttals to his account from workers. The PRA became the Centre for Better Health in 2010 and is now based on Darnley Road off Mare Street. The End of the Line for Hackney? – redevelopment of Liverpool Street station including office blocks. Also some proposals for more stations and their impact on the local community. Hackney Committee Against Racialism reports on canvassing local residents, removing NF graffiti and demanding that the Council ban fascists from using public property to pedal racialism including markets. Gay centres in Shoredtich and Finsbury Park were vandalised by fascists and a Labour Party anti-fascist canvasser was beaten up near Manor House. Occupation of Elizabeth Garrett Anderson Hospital in central London. Health Hierarchy – a more analytical piece about the power imbalance in the NHS and calls for more democratic control. Hackney Abortion Campaign and the effect of the cuts on women. GLC Tenants in Slum Housing: conditions on the Pembury Estate: “whole blocks of flats empty, boarded up, vandalised and left to decay. One block, Adisham House, has been empty for three years.” Also general disrepair for flats which are occupied – by residents which the article notes are primarily BME, squatters or former squatters. 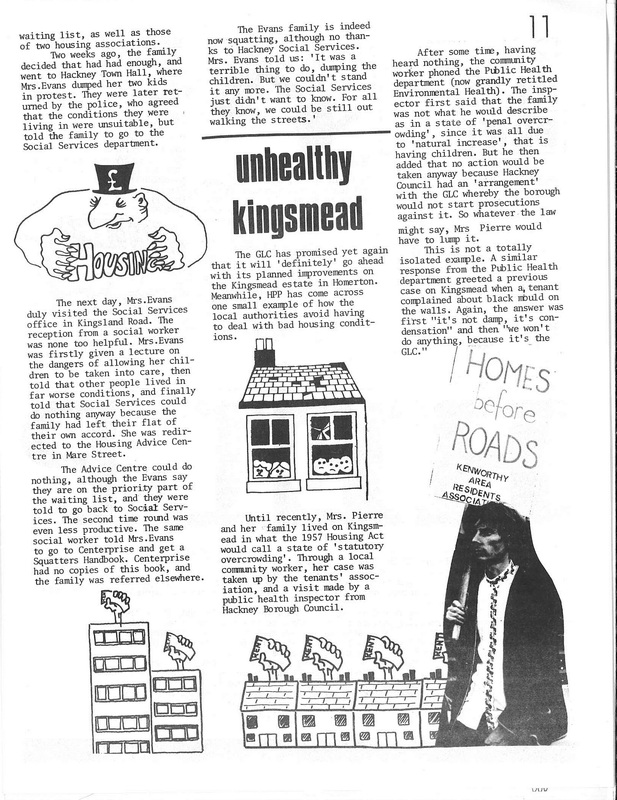 People Before Roads – opposition to a new road from Hackney Wick to Highbury. Also – opposition to education cuts, campaign against Dublin anarchists Noel and Marie Murray being hanged for robbing a bank, Regents Canal – a new walk in Hackney, Friends of the Earth forms, Half Moon Theatre, Hackney Women’s Aid asking for furniture etc for new premises, Gingerbread (assistance for single parents) plea for donations. 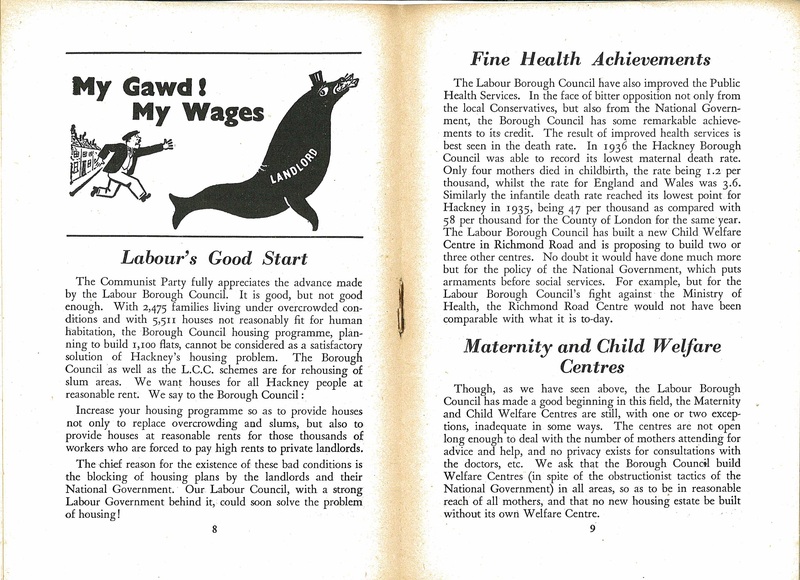 This pamphlet was produced by Hackney Communist Party, probably in 1937 – prior to the London County Council elections that year. 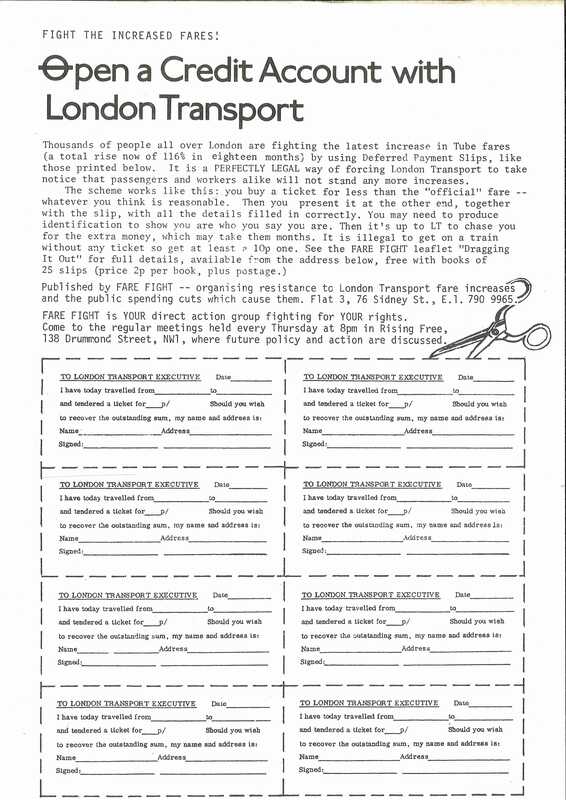 This page in the Amiel Melburn Trust Internet Archive suggests that similar pamphlets were produced for 28 London boroughs. 1937 was twenty years after the Bolshevik revolution in Russia and one year into the Spanish Civil War. But there is a disappointing lack of revolutionary zeal (or even mention of communism) in the text below – the focus is on critical support for the Labour Party and commendable bread and butter working class issues like health, housing and wages instead. This is partly down to Lenin, whose “Left Wing” Communism – An Infantile Disorder encouraged British communists to work with the Labour Party rather than taking a hardline extra-parliamentary position as suggested by Sylvia Pankhurst and others. So, whilst the General Strike of 1926 gets a mention, the Battle of Cable Street which had taken place in the previous year does not – even in the section on combatting fascism. 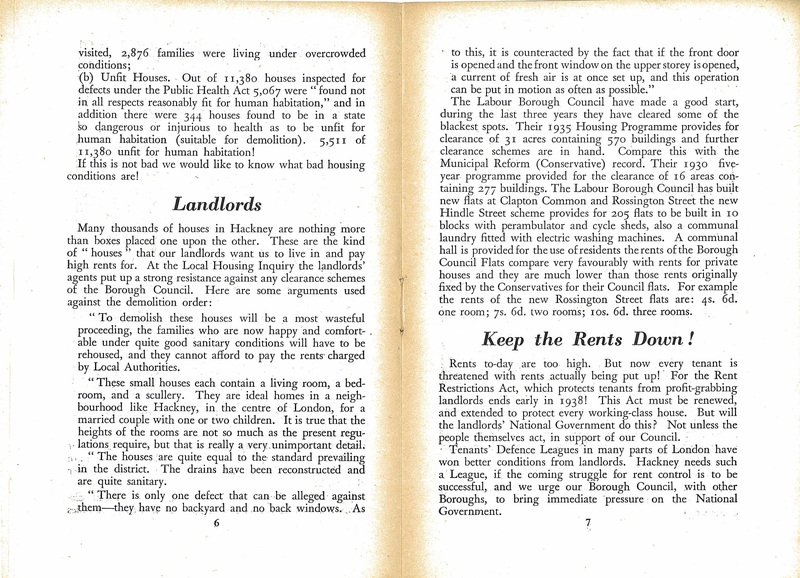 Some of the demands have resonances with today – landlords exploiting tenants with high rents and poor conditions, a lack of social housing or affordable childcare, poor people struggling to make ends meet etc. All the Hackney constituencies and Stoke Newington (which was then a separate borough) returned Labour councillors in the 1937 elections. 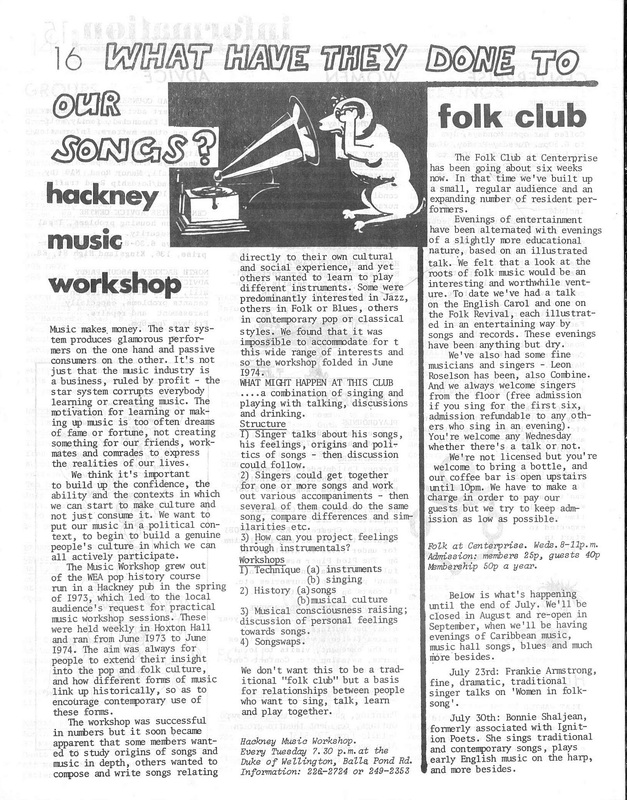 Bob Darke’s disaffection from the Hackney CP in the 1950s. A Hackney Communist Party banner from 1952. Of related interest is a look at Lenin in Hackney. The full text of the pamphlet follows below. I have amended some of the grammar, particularly some hyphenation that annoyed me. Scans of the original text are included too – you can click on the images to see a bigger version. 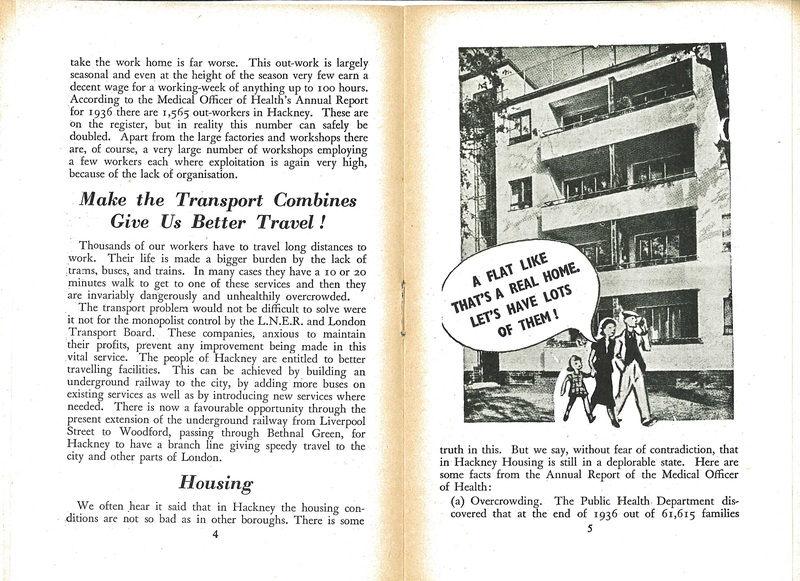 If anyone has a copy of Communist Plan for Life in Stoke Newington, please get in touch! Hackney’s nearness to the City of London has influenced its development from a country manor to a suburban town and finally to a part of London. With the growth of the City of London and the rise in influence of city merchants we see a change taking place also in Hackney. The ownership of Hackney passes from the landed aristocracy into the hands of the city merchants, with the result that [in] about 1700 Mr. Tyssen, one of the merchants, became the Lord of the Manor. Today, descendants of this Mr. Tyssen still own large parts of Hackney. Among other large landowners of Hackney today are of course the Ecclesiastical Commissioners, St. Thomas’ Hospital Estate and the Spurstowe Trust. With the growth of London we see workshops and factories rising in Hackney. Among the earliest known industries in Hackney were paint, and boot and shoe manufacturing, and as industry developed, so did working class activity! Hackney played its part in the famous Chartist Movement. Our workers providing a fair quota of Chartists, while the Lord of the Manor and his brother helped the Government to organise special constables in the attempt to prevent the demonstration of April 10, 1848. But this demonstration did meet – and elected delegates to present to Parliament the famous “Six Point Charter”, claiming political rights for the workers. 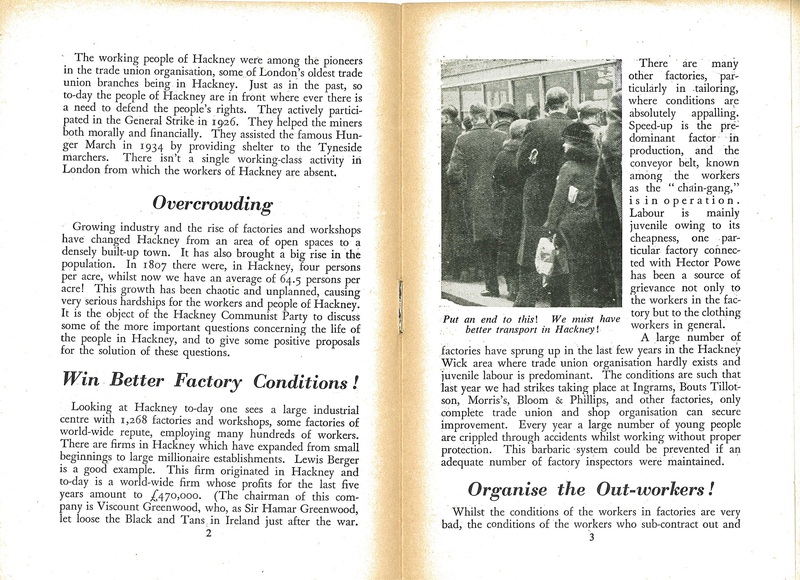 The working people of Hackney were among the pioneers in the trade union organisation, some of London’s oldest trade union branches being in Hackney. Just as in the past, so today the people of Hackney are in front wherever there is a need to defend the people’s rights. They actively participated in the General Strike in 1926. They helped the miners both morally and financially. They assisted the famous Hunger March in 1934 by providing shelter to the Tyneside marchers. There isn’t a single working-class activity in London from which the workers of Hackney are absent. Growing industry and the rise of factories and workshops have changed Hackney from an area of open spaces to a densely built-up town. It has also brought a big rise in the population. In 1807 there were, in Hackney, four persons per acre, whilst now we have an average of 64.5 persons per acre! This growth has been chaotic and unplanned, causing very serious hardships for the workers and people of Hackney. 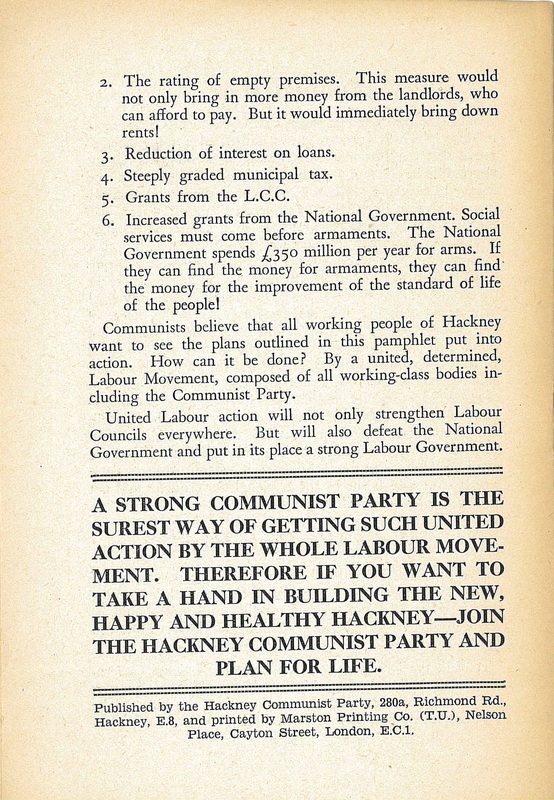 It is the object of the Hackney Communist Party to discuss some of the more important questions concerning the life of the people in Hackney, and to give some positive proposals for the solution of these questions. Win Better Factory Conditions ! There are many other factories, particularly in tailoring, where conditions are absolutely appalling. Speed-up is the predominant factor in production, and the conveyor belt, known among the workers as the ” chain-gang,” is in operation. Labour [i.e. the workers] is mainly juvenile owing to its cheapness, one particular factory connected with Hector Powe [tailors] has been a source of grievance not only to the workers in the factory but to the clothing workers in general. A large number of factories have sprung up in the last few years in the Hackney Wick area where trade union organisation hardly exists and juvenile labour is predominant. The conditions are such that last year we had strikes taking place at Ingrarns, Bouts Tillotson, Morris’s, Bloom & Phillips, and other factories. Only complete trade union and shop organisation can secure improvement. Every year a large number of young people are crippled through accidents whilst working without proper protection. This barbaric system could be prevented if an adequate number of factory inspectors were maintained. Whilst the conditions of the workers in factories are very bad, the conditions of ‘the workers who subcontract out and take the work home is far worse. This out-work is largely seasonal and even at the height of the season very few earn a decent wage for a working week of anything up to 100 hours. 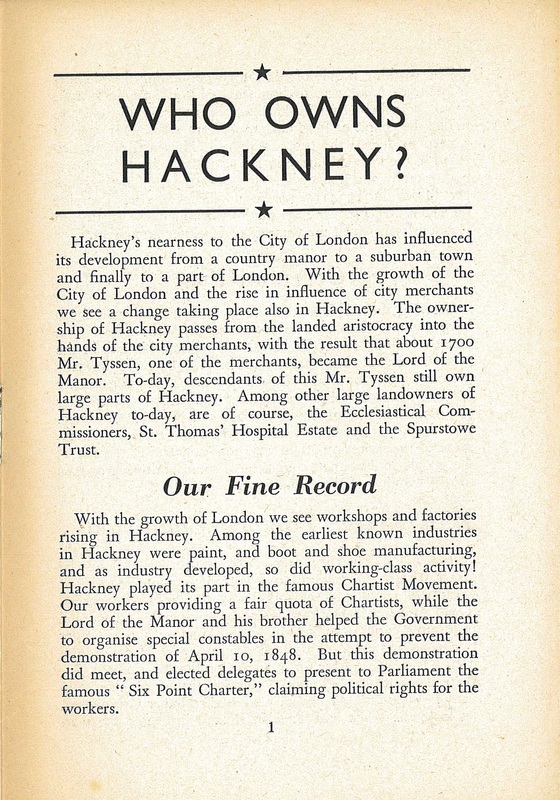 According to the Medical Officer of Health’s Annual Report for 1936 there are 1,565 out-workers in Hackney. These are on the register, but in reality this number can safely be doubled. Apart from the large factories and workshops there are, of course, a very large number of workshops employing a few workers each where exploitation is again very high, because of the lack of organisation. Make the Transport Combines Give Us Better Travel! Thousands of our workers have to travel long distances to work. Their life is made a bigger burden by the lack of trains, buses, and trains. In many cases they have a 10 or 20 minutes walk to get to one of these services and then they are invariably dangerously and unhealthily overcrowded. The transport problem would not be difficult to solve were it not for the monopolist control by the London & North Eastern Railway and London Transport Board. These companies, anxious to maintain their profits, prevent any improvement being made in this vital service. The people of Hackney are entitled to better travelling facilities. This can be achieved by building an underground railway to the city, by adding more buses on existing services as well as by introducing new services where needed. There is now a favourable opportunity through the present extension of the underground railway from Liverpool Street to Woodford, passing through Bethnal Green, for Hackney to have a branch line giving speedy travel to the city and other parts of London. (b) Unfit Houses. Out of 11,380 houses inspected for defects under the Public Health Act 5,067 were “found not in all respects reasonably fit for human habitation,” and in addition there were 344 houses found to be in a state so dangerous or injurious to health as to be unfit for human habitation (suitable for demolition). 5,511 of 11,380 unfit for human habitation! If this is not bad we would like to know what bad housing conditions are! The Labour Borough Council have made a good start, during the last three years they have cleared some of the blackest spots. Their 1935 Housing Programme provides for clearance of 31 acres containing 570 buildings and further clearance schemes are in hand. Compare this with. the Municipal Reform (Conservative) record. Their 1930 five-year programme provided for the clearance of 16 areas containing 277 buildings. The Labour Borough Council has built new flats at Clapton Common and Rossington Street. The new Hindle Street scheme provides for 205 flats to be built in blocks with perambulator and cycle sheds, also a communal laundry fitted with electric washing machines. A communal hall is provided for the use of residents. The rents of the Borough Council Flats compare very favourably with rents for private houses and they are much lower than those rents originally fixed by the Conservatives for their Council flats. For example the rents of the new Rossington Street flats are: 4s. 6d. one room; 7s. 6d. two room’s; 10s. 6d. three rooms. Rents today are too high. But now every tenant is threatened with rents actually being put up! 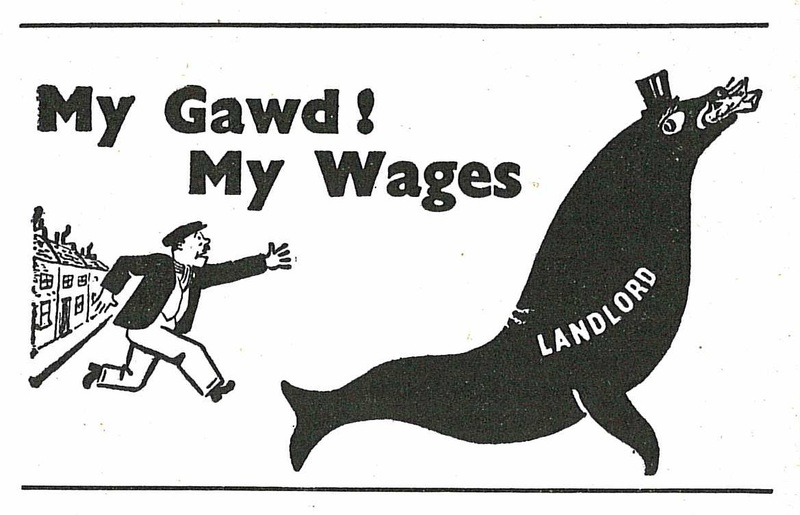 For the Rent Restrictions Act, which protects tenants from profit-grabbing landlords ends early in 1938! This Act must be renewed, and extended to protect every working-class house. But will the landlords’ National Government do this? Not unless the people themselves act, in support of our Council. Tenants’ Defence Leagues in many parts of London have won better conditions from landlords. Hackney needs such a League, if the coming struggle for rent control is to be successful, and we urge our Borough Council, with other Boroughs, to bring immediate pressure on the National Government. Increase your housing programme so as to provide houses not only to replace overcrowding and slums, but also to provide houses at reasonable rents for those thousands of workers who are forced to pay high rents to private landlords. The chief reason for the existence of these bad conditions is the blocking of housing plans by the landlords and their National Government. Our Labour Council, with a strong Labour Government behind it, could soon solve the problem of housing! The Labour Borough Council have also improved the Public Health Services. In the face of bitter opposition not only from the local Conservatives, but also from the National Government, the Borough Council has some remarkable achievements to its credit. The result of improved health services is best seen in the death rate. In 1936 the Hackney Borough Council was able to record its lowest maternal death rate. Only four mothers died in childbirth, the rate being 1.2 per thousand, whilst the rate for England and Wales was 3.6. Similarly the infantile death rate reached its lowest point for Hackney in 1935, being 47 per thousand as compared with 58 per thousand for the County of London for the same year. The Labour Borough Council has built a new Child Welfare Centre in Richmond Road and is proposing to build two or three other centres. No doubt it would have done much more but for the policy of the National Government, which puts armaments before social services. For example, but for the Labour Borough Council’s fight against the Ministry of Health, the Richmond Road Centre would not have been comparable with what it is today. Though, as we have seen above, the Labour Borough Council has made a good beginning in this field, the Maternity and Child Welfare Centres are still, with one or two exceptions, inadequate in some ways. The centres are not open long enough to deal with the number of mothers attending for advice and help, and no privacy exists for consultations with the doctors, etc. We ask that the Borough Council build Welfare Centres (in spite of the obstructionist tactics of the National Government) in all areas, so as to be in reasonable reach of all mothers, and that no new housing estate be built without its own Welfare Centre. Every year there are 3,000 babies born in Hackney. The majority of them are born of working-class parents whose mothers cannot afford to go into private nursing homes, and who are forced either to have their babies at home (often in already overcrowded premises) or seek confinement accommodation outside of our Borough. This is an intolerable position and we demand that a modern Maternity Hospital be built in Hackney. Our Borough is not a poor Borough; if we can afford to spend £250,000 for a new Town Hall, and also to spend £3,000 on Coronation decorations, and pay 5 per cent. interest on loans to the Ecclesiastical Commissioners, surely we can afford to spend an appropriate sum for a Maternity Hospital. Milk, the most essential body-building food, is absent from many homes in Hackney. It is too dear to buy. Many a mother cannot afford the price of 3 1/2 d. per pint, Yet milk is cheap for industrial purposes. More than 1d. out of 3 1/2 d. you pay goes to subsidise the manufacture of butter, cheese, chocolate and other milk products. These manufacturers get their supplies of milk as low 1/2 d. per pint. London’s milk trade is dominated almost entirely by one huge company, the United Dairies. Over the past 10 years this company has netted nearly £6,000,000. The National Government protects the profits of these huge combines and with its armaments programme forces food prices to go up. The cost of living is rising every day and housewives find it more difficult to get enough, bread, let alone milk. 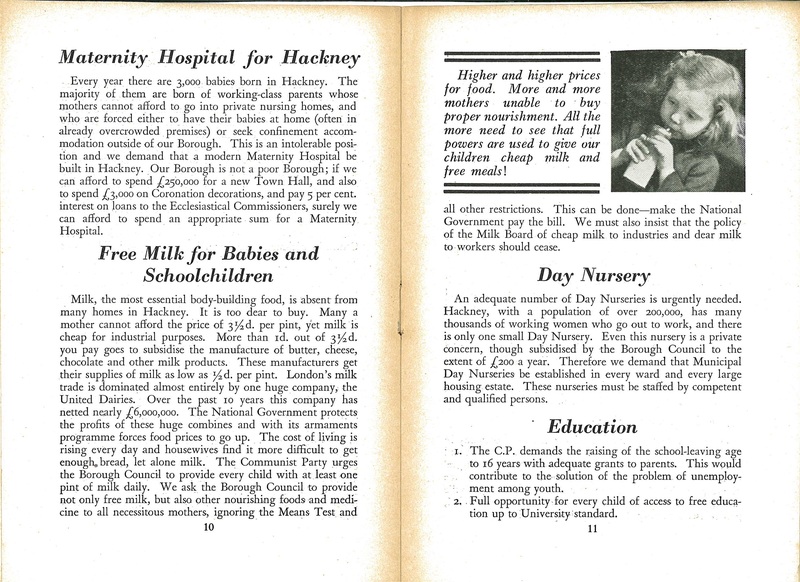 The Communist Party urges the Borough Council to provide every child with at least one pint of milk daily. We ask the Borough Council to provide not only free milk, but also other nourishing foods and medicine to all necessitous mothers, ignoring the Means Test and all other restrictions. This can be done—make the National Government pay the bill. We must also insist that the policy of the Milk Board of cheap milk to industries and dear milk to workers should cease. Higher and higher prices for food. More and more mothers unable to buy proper nourishment. All the more need to see that full powers are used to give our children cheap milk and free meals! An adequate number of Day Nurseries is urgently needed. Hackney, with a population of over 200,000, has many thousands of working women who go out to work, and there is only one small Day Nursery. Even this nursery is a private concern, though subsidised by the Borough Council to the extent of £200 a year. Therefore we demand that Municipal Day Nurseries be established in every ward and every large housing estate. These nurseries must be staffed by competent and qualified persons. The C.P. demands the raising of the school-leaving age to 16 years with adequate grants to parents. This would contribute to the solution of the problem of unemployment among youth. Full opportunity-for every child of access to free education up to University standard. Limitation of classes in accordance with the National Union of Teachers demands. Provision of sufficient number of well-equipped modern schools, especially in areas where large new housing estates have been built. Hands Of the Unemployment Fund ! Food Before Guns ! A 40-hour week for all workers. The Borough Council to give a lead to introduce this at once for municipal employees. A fortnight’s holiday for all with pay. All the Borough Council building schemes to be carried out by direct labour under T.U. rates and conditions. Full relief for unemployed at T.U. Congress scales: 20s. each adult, 10s. each dependant, 5s. each child, and full relief for single men and women. Abolition of the Means Test. 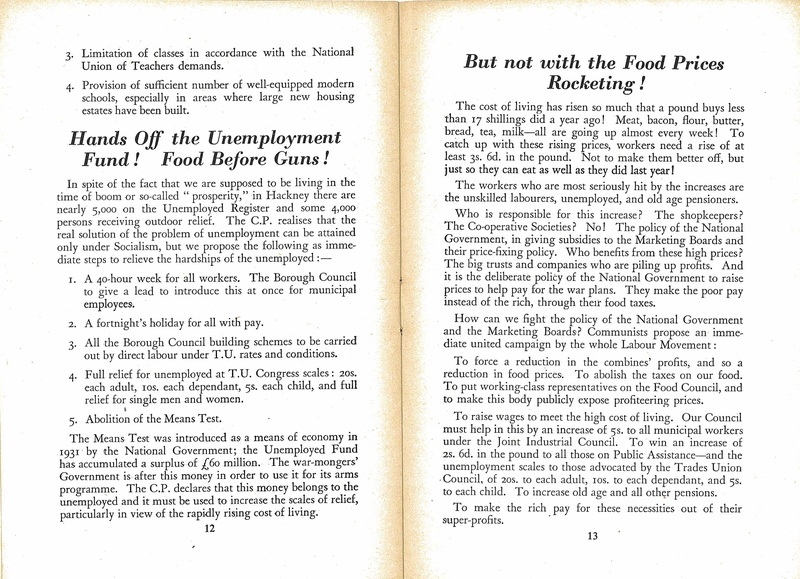 The Means Test was introduced as a means of economy in 1931 by the National Government; the Unemployed Fund has accumulated a surplus of £60 million. The war-mongers’ Government is after this money in order to use it for its arms programme. The C.P. declares that this money belongs to the unemployed and it must be used to increase the scales of relief, particularly in view of the rapidly rising cost of living. But not with the Food Prices Rocketing! The cost of living has risen so much that a pound buys less than 57 shillings did a year ago! Meat, bacon, flour, butter, bread, tea, milk—all are going up almost every week ! To catch up with these rising prices, workers need a rise of at least 3s. 6d. in the pound. Not to make them better off, but just so they can eat as well as they did last year! The workers who are most seriously hit by the increases are the unskilled labourers, unemployed, and old age pensioners. Who is responsible for this increase? The shopkeepers? The Co-operative Societies? No! The policy of the National Government, in giving subsidies to the Marketing Boards and their price-fixing policy. Who benefits from these high prices? The big trusts and companies who are piling up profits. And it is the deliberate polity of the National Government to raise prices to help pay for the war plans. They make the poor pay instead of the rich, through their food taxes. To force a reduction in the combines’ profits, and so a reduction in food prices. To abolish the taxes on our food. To put working-class representatives on the Food Council, and to make this body publicly expose profiteering prices. To raise wages to meet the high cost of living. Our Council must help in this by an increase of 5s. to all municipal workers under the Joint Industrial Council. To win an increase of 2s. 6d. 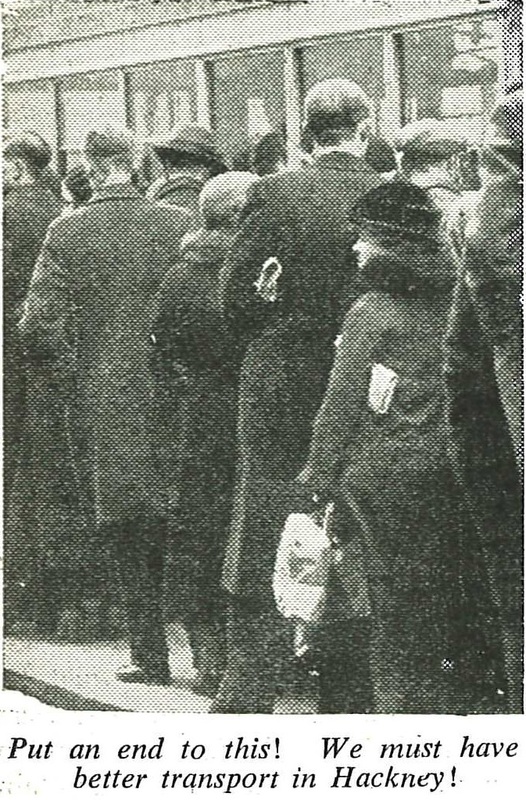 in the pound to all those on Public Assistance—and the unemployment scales to those advocated by the Trades Union Council, of 20s. to each adult, 10s. to each dependant, and 5s. to each child. To increase old age and all other pensions. To make the rich pay for these necessities out of their super-profits. “Electricity is cheap in Hackney,” says the Borough Council. But it is not cheap to the small consumer. The scale of charges favours the rich. For example, it varies in price from 1/2 d. to 4 1/4 d. per unit, and for industrial purposes the rate is half that of the domestic rate. For example, in 1936 the industrialists paid an average of 1.09d. per unit and domestic users paid an average of 2.01d. per unit. We want the unification of the scales of charges, and free wiring installations for all working-class houses to make electricity available to all. Banning of all Fascist meetings in Hackney, whether outdoor or indoor. The closing of the Fascist barracks. Democratic control of the police to ensure protection against Fascist attacks. With the continued existence of the National Government in office the war menace grows daily. Everything goes to prove that the National Government is encouraging Fascist aggression abroad and at home. Spain and China today, and it may be England tomorrow. How can those who are leading us to war be trusted to protect us against war? Can the National Government and their local Conservative allies, who have continually condemned the British working class to ill-health and starvation with their economy stunts, Means Tests and rising prices, be trusted? Can these people be trusted to protect us from air raid attack? Obviously not! We believe that the only defence for peace is the defeat of the National Government and their local allies. We do not think that war is inevitable, but we believe the National Government should be made responsible for the supply of suitable protection equal to that for the rich. Gas masks must be of the very best quality, and the construction of gas- and bomb-proof shelters, under the control of the Borough Council, should be undertaken at once. All air raid precautions should be democratically controlled by the Borough Council and the working bodies in the Borough. The full cost of these schemes must be borne by the National Government and not by the Borough Council. The proposals as outlined in the preceding pages will, of course, require money. Now, where is the money to come from? This need not come from the rates, but should be borne by the people who are exploiting. Hackney. How can this be done? End the Derating Act, by which the National Government relieved the rich employers of three-quarters of the rates making the workers foot the bill. Make employers pay their rates in full! The rating of empty premises. This measure would not only bring in more money from the landlords, who can afford to pay. But it would immediately bring down rents! Reduction of interest on loans. Increased grants from the National Government. Social services must come before armaments. The National Government spends £350 million per year for arms. If they can find the money for armaments, they can find the money for the improvement of the standard of life of the people! 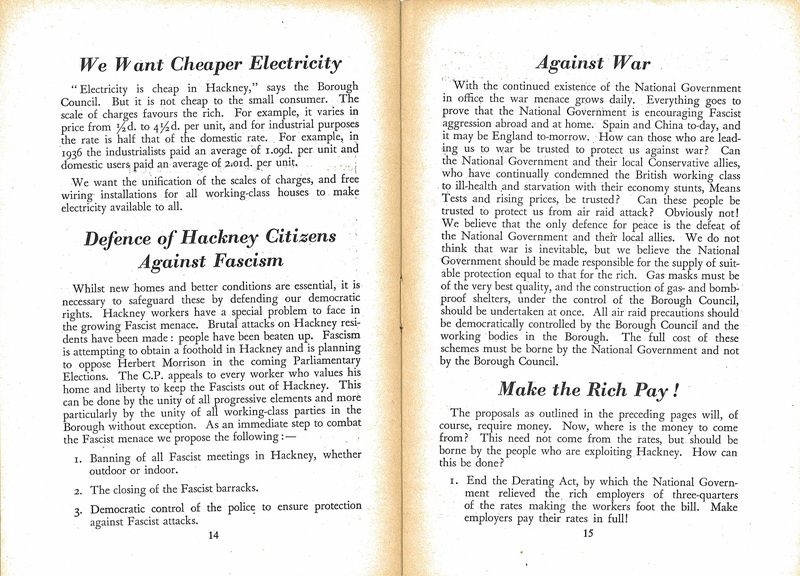 Communists believe that all working people of Hackney want to see the plans outlined in this pamphlet put into action. How can it be done? By a united, determined, Labour Movement, composed of all working class bodies including the Communist Party. United Labour action will not only strengthen Labour Councils everywhere. But will also defeat the National Government and put in its place a strong Labour Government. 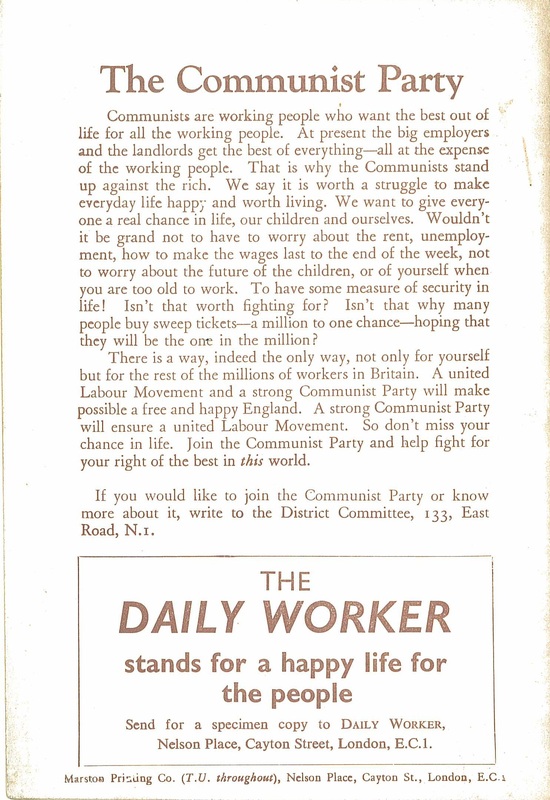 Published by the Hackney Communist Party, 280a, Richmond Rd., Hackney, E.8, and printed by Marston Printing Co. (T.U. ), Nelson Place, Cayton Street, London, E.C.1. My HPP archive is missing the issues between the debut in 1973 and the ones below, but a previous post highlights an edition I don’t have from 1974. Both of these issues are about 3 quarters A4 size. The May issue is 12 pages and the July one (below) is one sheet bigger at 16 pages. Abortion – opposition to a private members’ bill seeking to disallow abortions except where a doctor agreed that there was a risk to a woman’s life or health. (Like a lot of these bills, it didn’t go anywhere. Hard to say whether that is through resistance or lack of support). Also the lowdown on the difficulties faced by women seeking abortions in Hackney. Hackney Helps Hoteliers – on the huge subsidy (£450,000 a year) paid by the council to the owners of bed and breakfasts so they could house 155 homeless families. Hackney was the top borough in London for this at the time. The article rightly points out that the money would be better spent on building or acquiring council houses. Nearby Camden had purchased several thousand homes for this purpose over the previous few years, compared to 189 by Hackney in 1974 – and 37 in 1973. Hackney Reading Centre – a new joint adult education venture between Centerprise and City and East London College. Centerprise – funding difficulties and a deficit had built up. The council had refused to increase its £1000 a year grant. Hackney Health Guide – a four page feature on health facilities in the borough – and also the issues they faced. Stop The Road – opposition to proposals for a huge new road from Dalston to Hackney Wick. Marsh Festival – taking place in July with a “Hackney Marsh on Sea” theme – Punch and Judy, donkey derby, etc. Groups / Contacts – everything from Gamblers Anonymous to playgroups and 3 branches of Hackney Young Socialists. The meeting was adjourned after the senior nursing officer attempted (unsuccessfully) to break it up. The Hackney hospitals branch of the Mental Patients Union is the first in the country to achieve recognition. Psychiatric wings in both the German and Hackney Hospital are affected. The MPU aims to bring about a better deal for patients in mental hospitals, and improved status. Mr Andrew Roberts, of the Hackney branch, claims that several patients in Hackney Hospital psychiatric wing had spoken of better treatment by staff since the branch was recognised on July 18. People’s News Service 1.6.1974 “MENTAL PATIENTS’ UNION MEMBER ESCAPES COMPULSORY DRUG TREATMENT. Last week Tony O’Donnell moved into the house of the Mayola Road Mental Patients Union in East London after a long struggle to find a place where he could live without having to undergo injections of modicate, an extremely strong drug used on people diagnosed as schizophrenic…”. We ran the Robin Farquharson House in Mayola Road for three years. This was divided into individual rooms that were entirely under resident’s control, but it also had an office which served as a crash pad in emergencies. We often had people staying who were going through a crisis and who were supported by other residents. We also helped and advised people by telephone and letter, and there were any visitors from all over the country as well as from abroad. Hoxton Hall – 80 years of its role as a hub for working class culture and education. Stop The Road – the proposed Dalston to Hackney Wick road was refused by the council, but there was concerns it could still be pushed through by the GLC. 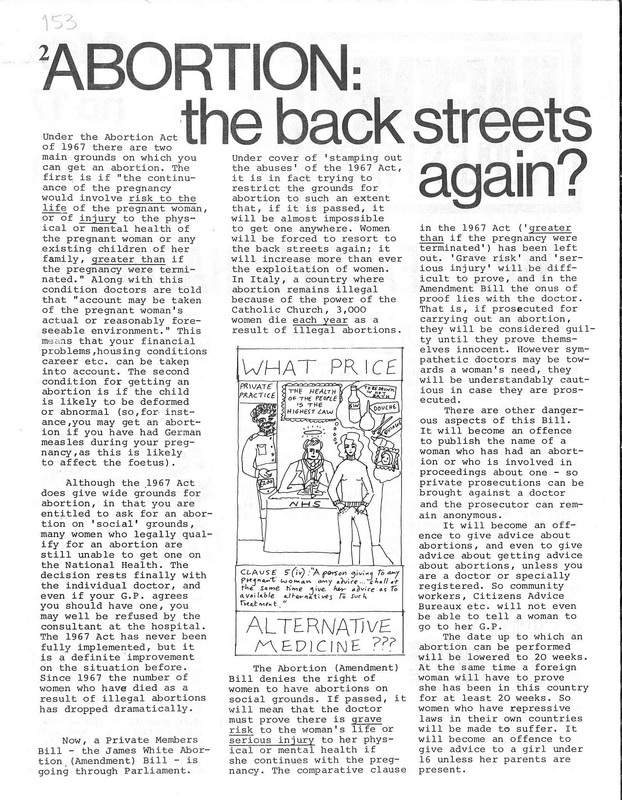 Health on the Cheap – a critical article about the reorganisation of Hackney hospitals by an anonymous doctor who had worked in them. Abortion: the fight goes on – report on a demonstration against the proposed amendments to abortion law covered above. And the general lack of access to abortions for women in Hackney even without it. Hackney Women’s Aid – short feature on women’s refuges etc. The absence of funding from Hackney Council is very troubling. Nursery Nurses Win – negotiations culminate in an agreed 36 hour week and backdated pay rise. Repairs: Who carries the can? – The state of the 26,000 council homes in Hackney. HPP conducted surveys amongst tenants in De Beauvoir and Stonebridge – a number of issues were identified. Also groups and contacts (pretty much as above, but now includes Hackney Committee Against Racialism), a call for help with the paper, various upcoming events. A round up of housing news including housing association / council skullduggery and some properly horrible stories about housing situations people in Hackney had to endure. Plus! Music on the back page! Music makes money. The star system produces glamorous performers on the one hand and passive consumers on the other. It’s not just that the music industry is a business – ruled by profit – the star system corrupts everybody learning or creating music. The motivation for learning or making up music is too often dreams of fame or fortune, not creating something for our friends, workmates or comrades to express the realities of our lives. Having said all that, Hackney Music Workshop looks like it did great work! 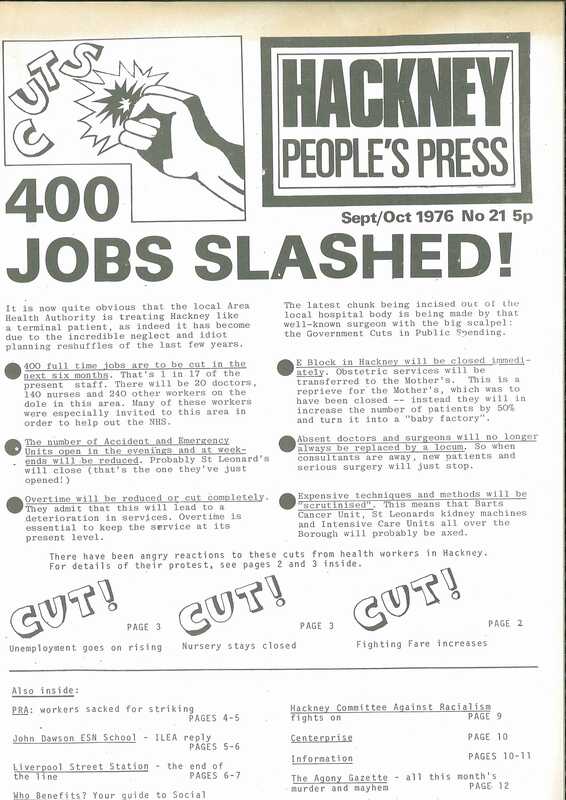 Hackney People’s Press was a local left-leaning community newspaper published regularly from 1973 until 1985. An interview with HPP contributor Charles Foster is available elsewhere on this site. 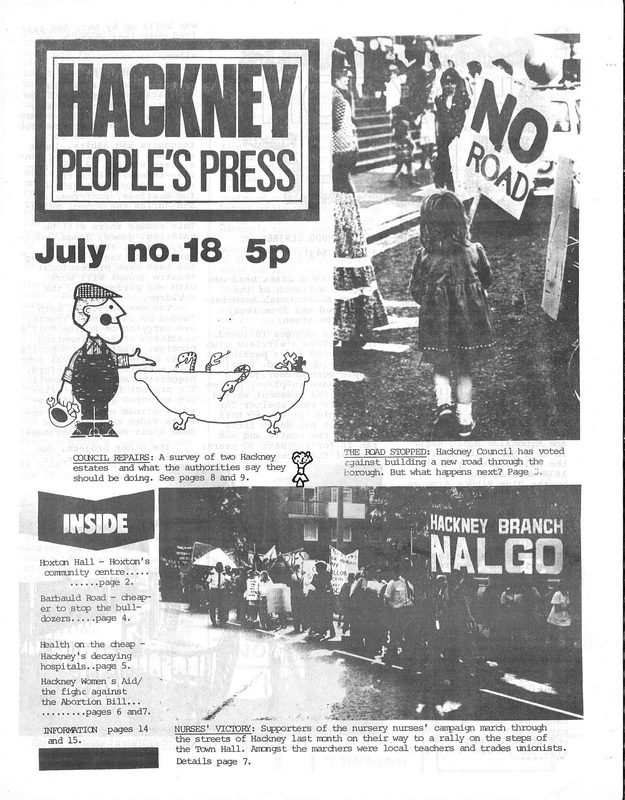 As you can see from the masthead below, HPP was formed by the merger of Hackney Action and Hackney Gutter Press, who were both publishing in the early 70s and have also been covered here previously. 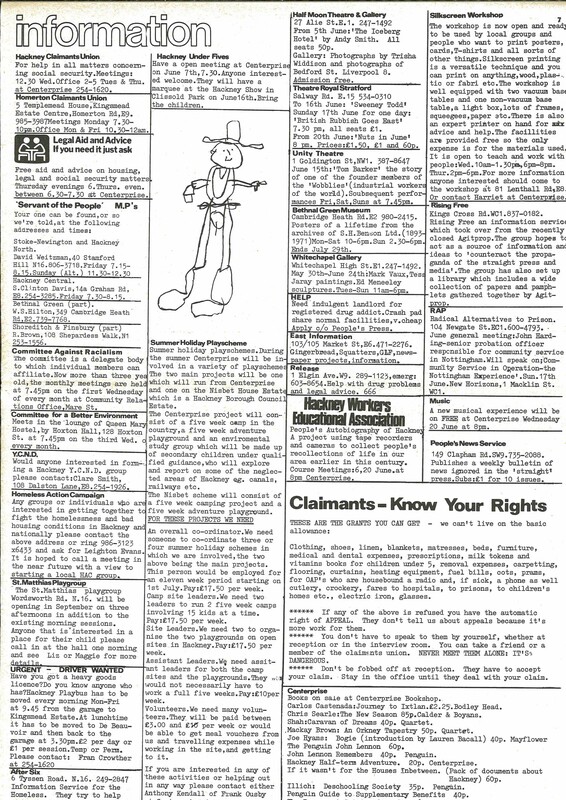 The issues below are all large tabloid format – click on the images for a full size version. The debut issue – 5 pence, worra bargain! As you can see from the introduction on the cover, the plan was to publish monthly and to hold open public meetings for contributors. The issues I have from 1973 suggests that this schedule was kept to initially. (Although the page count went down from 12 to 8). 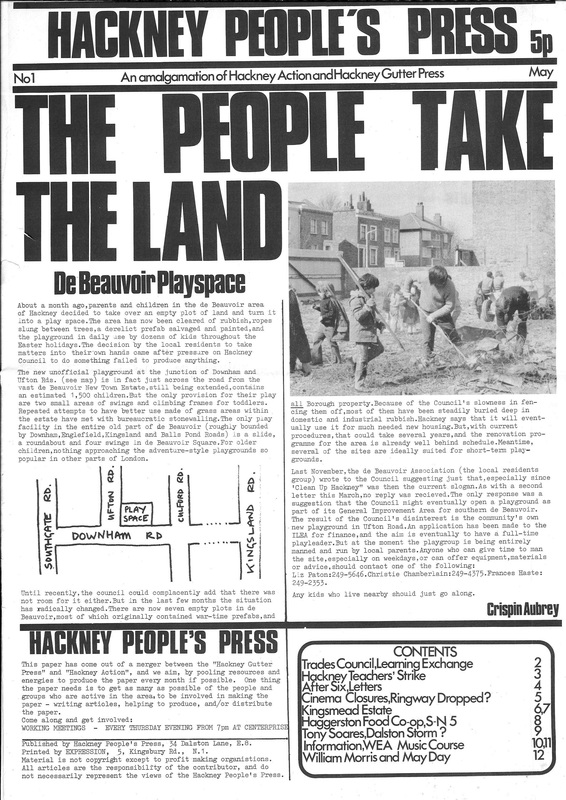 We kick off with an excellent lead story on parents in De Beauvoir seizing some vacant land to use as an adventure playground for kids. The author, Crispin Aubrey, was an interesting figure who was later prosecuted under the official secrets act for interviewing a former GCHQ worker. 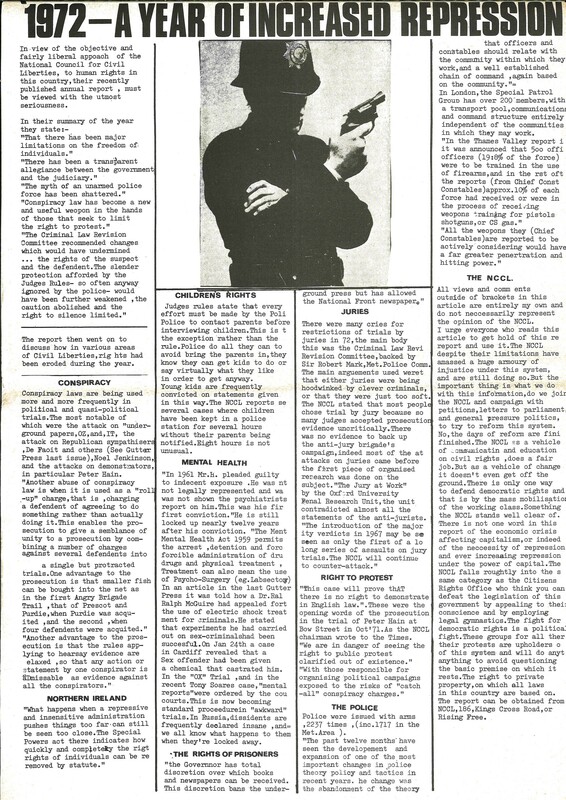 (The De Beauvoir Association has published an archive of the “De Beaver” newsletter from the 1970s and 80s which is well worth a look and also covers this). Learning Exchange: a free service which puts people interested in learning the same subject in touch with each other. (c/o Centerprise). Support for striking teachers campaigning for an increase in the London Allowance (and concern that rising housing, prices etc mean that teachers were leaving London – just like now). After Six in Hackney: full page piece on an advice service for homeless people, operating after 6pm every evening. Homes Saved From Ringway: 1,000 properties no longer being demolished because of the collapse of plans for a big road through Dalston and Hackney Wick following protests. Also interesting to see the council criticised for making Kingsmead into a ghetto, concentrating black people, OAPs and benefit claimants there, the implication being that other estates were reserved for white, relatively more affluent types? 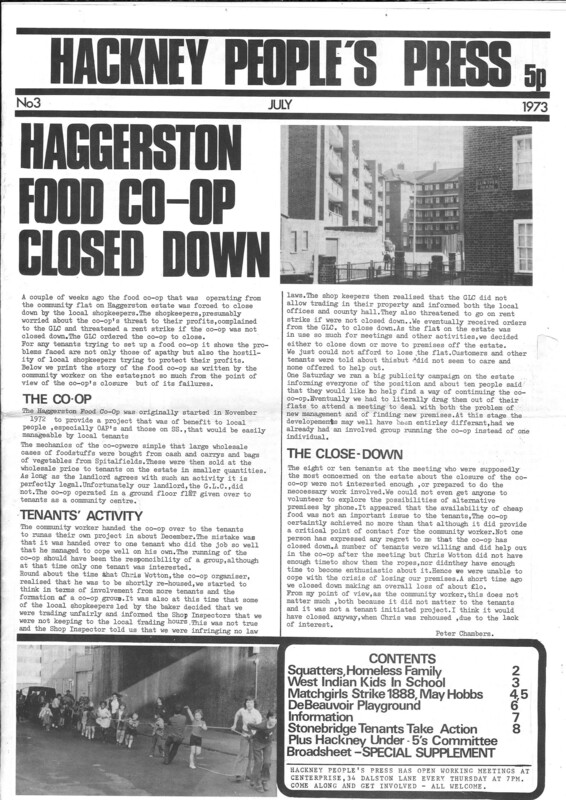 Haggerston Food Co-Op is introduced (but more on them below). Perhaps slightly jarring with the community articles is a press release about the Stoke Newington 5 (originally the Stoke Newington 8). Tony Soares (who ran the Grass Roots bookshop in Ladbroke Grove) writes about being convicted for “incitement to murder persons unknown“. Which is as mad as it sounds. 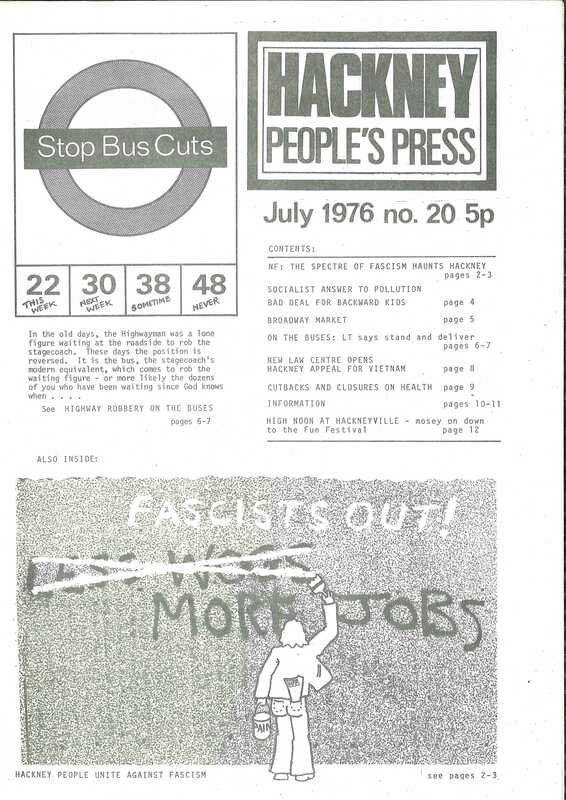 Turns out Tony had reprinted the Black Panther Party’s “On organising self-defence groups” article: “The police conceded that there probably would have been no prosecution had it not been for a complaint from Jack Backsi, the Community Relations Officer for Hackney”. 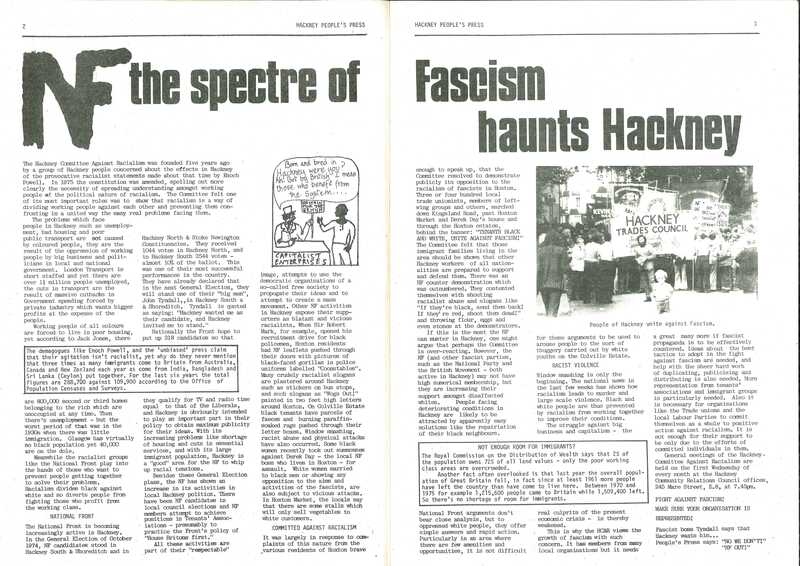 Backsi apparently referred the publication to Hackney’s then MP Stanley-Clinton David, asking him to raise it in parliament. Soares was sentenced to 200 hours of community service, which suggests that everyone agreed that the threat he posed was minimal – but that this sort of politics was not welcome in the UK. There’s a story about some black youths being hassled by the police because one of them was carrying a walking stick – and how this was falsely reported as “Mob Storms Police Station” by the Hackney Gazette. Also two pages of contact info for community and political groups, and a back page piece by Ken Worpole on William Morris and the meaning of May Day. Issue 2 leads with a story about a mother and 4 young kids being evicted from an empty house that they had squatted after waiting for 4 years on the council list. The 3 other squatters who helped her to re-occupy the property were charged with assaulting the police. Unhealthy Health Report – NHS understaffing, infant mortality 33% higher in Hackney than the average for England and Wales, drop in ante natal care sessions, criticism of factory inspectors (2,546 factory premises in Hackney! ), etc. Mike Knowles of Hackney Trades Council is given a full page right of reply to the drubbing they got in the first issue. Alongside the correction of some errors in the original article, the general tone is that it’s alright for lefty activists to hold forth about a general strike and socialism but the real issue is how to actually get there – especially if it’s not possible to organise a one day strike on May Day as was being mooted. Page 2 covers the trial of the squatters featured on the cover of issue 2. Five charges of breach of the peace were dropped as the cops couldn’t produce their lead witness. Two women were found guilty of obstructing the police (the sentence/fine isn’t mentioned). 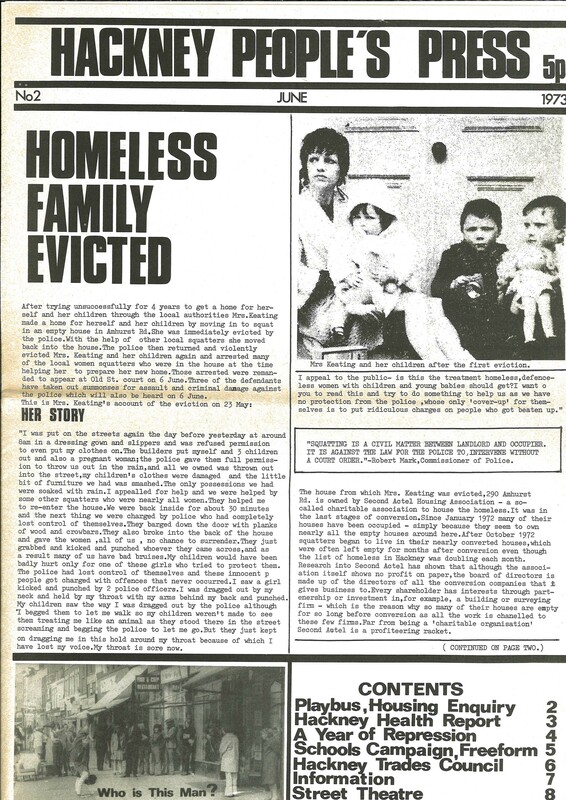 More happily it’s also reported that Anita Keating, the mother who was evicted, was now squatting successfully in Islington with her kids. 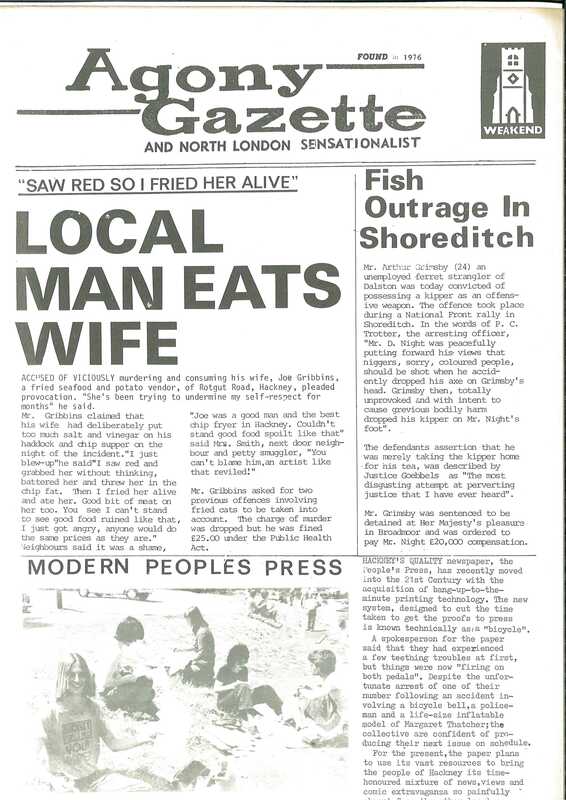 The centre pages contrast the Matchgirls strike of 1888 with a strike by Ministry of Defence contract cleaners in 1972. A report on a family of squatters who have had to move 11 times in the last 8 years. An update on De Beauvoir playground which seemed to be doing well despite council indifference. Hackney and Islington World Development Group – concerned with global poverty, development, trade. Workers Education Association music workshop, Learning Exchange, listings. The back page reports on some incredible community direct action. 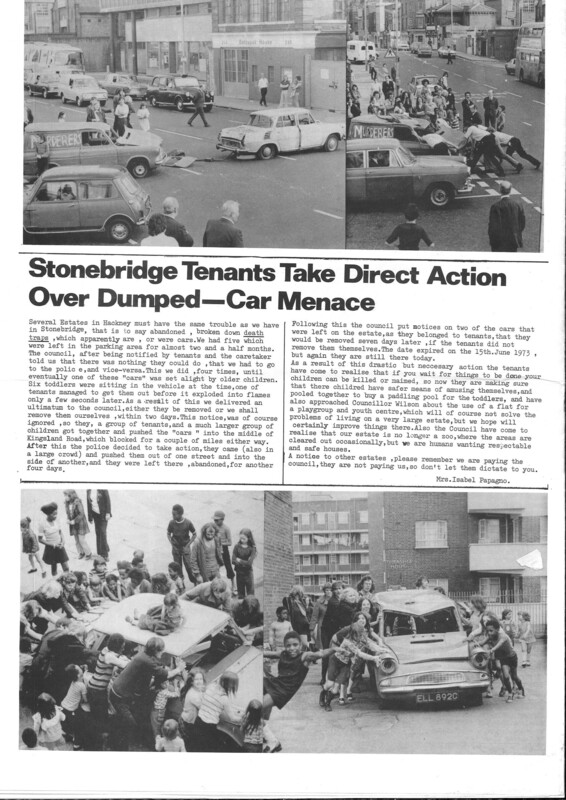 After getting nowhere with the police or the council, Stonebridge residents move cars which have been dumped on their estate into the middle of Kingsland Road, causing a traffic jam, but resolving the issue! Echoes of this sort of thing were later seen with Reclaim The Streets, where old bangers were driven into the middle of big roads as a way of blocking them off before a party commenced. Hackney Independent Working Class Association were still shaming the council about dumped cars in the south of the Borough in the early 21st Century. Mr. Pike To ask the Secretary of State for the Home Department what was the cost to local authorities of dealing with squatters in the last 12 months for which figures are available. Mr. Maclean I understand from my right hon. Friend the Secretary of State for the Environment that this information is not recorded centrally and could be obtained only at disproportionate cost. Mr. Pike To ask the Secretary of State for the Home Department what estimates he has as to the number of squatters there are currently in England; and if he will make a statement. Mr. Maclean The nature of squatting makes it impossible to assess the number of squatters with any degree of accuracy, but estimates as to the total number of people squatting in England and Wales generally range between 30,000 and 50,000. More precise information is, however, available about the number of local authority dwellings under unauthorised occupation: on 1 April 1993 there were 2,963 local authority dwellings so occupied, of which 88 per cent. were in inner London: Hackney—1,152; Lambeth—327; Tower Hamlets—232; Camden—153; and Islington—135—being among the areas worst affected. David Maclean is a Tory who campaigned vigorously for fox hunting, and against the Freedom of Information Act applying to Parliament. Oh, and for keeping MP’s expenses secret, which would have meant we never knew about his tax-payer funded flat screen TV and quad bike). He stepped down as an MP in 2010 and was made a life peer shortly afterwards. Peter Pike was the Labour MP for Burnley from 1983-2005. It’s unclear what he had against squatters, but I’ve not been able to find any expenses scandal linked to him. 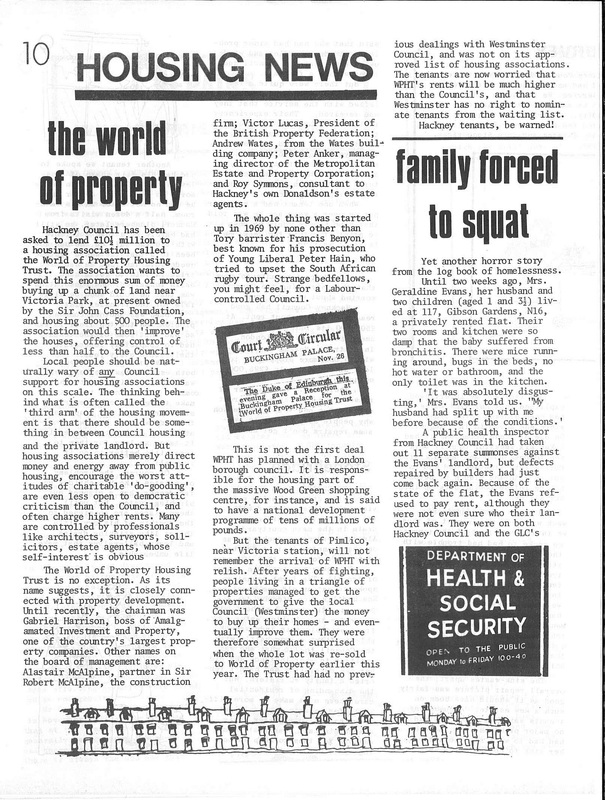 Another source estimated a total of 3,500 squatted properties in Hackney in the late 80s / early 90s. (i.e including council property and other types). 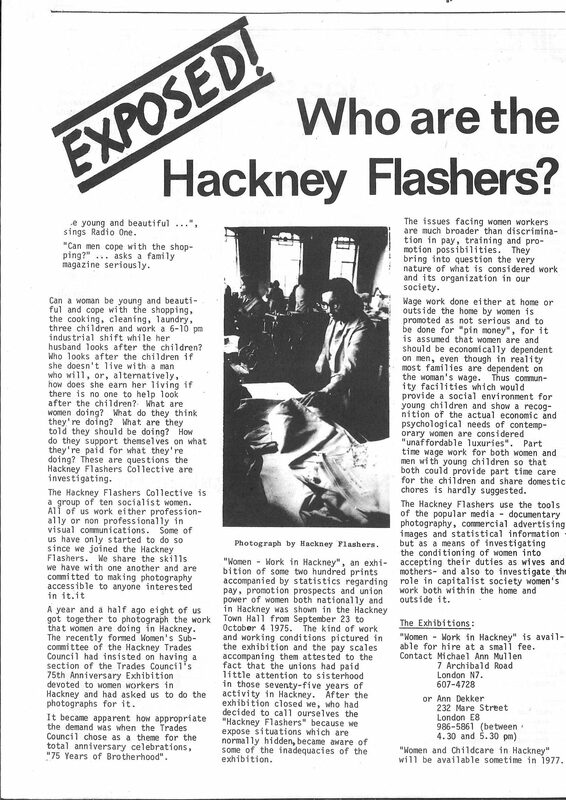 It’s probably worth pointing out that the high point of squatting in Hackney would have been the mid 1980s. Any more statistics welcome.